Last month I delivered a talk to the Nerd Nite East Bay gathering titled “Diversity in Deepest Oakland: Rocks of the Town.” It was fun, and the audience was good. 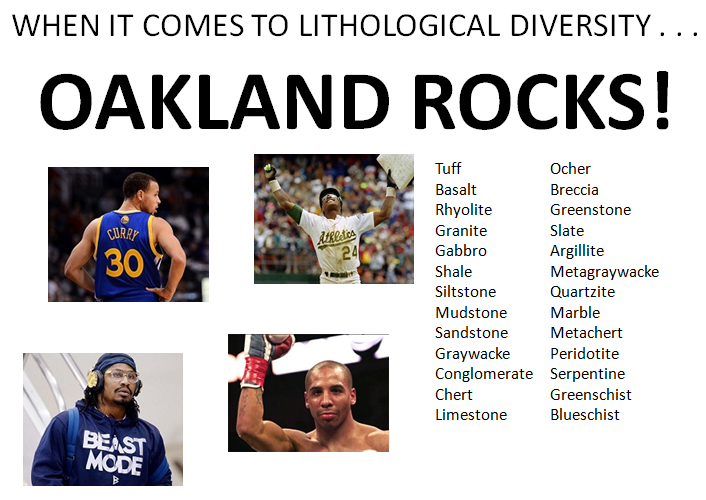 I made the case that per square kilometer, Oakland has more different rock types than any other city in America. I counted off more than 25 different specific rock types (shale, schist etc.) occurring in Oakland. Although most of the rocks I showed the group have already been featured on this blog, here are a few new ones. These images from my talk are big, so I’ll try to restrain myself. 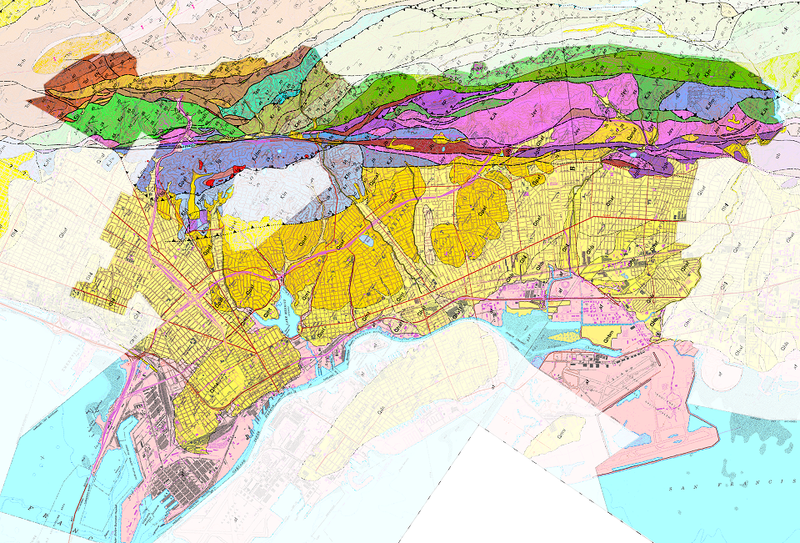 Before I start, here’s a version of the Oakland geologic map that I dubbed “Beast Oakland.” I never tried this orientation before, and I like the result. It brings out the Hayward fault vividly. I pointed out that because it has pulled together two very different sets of rocks, the Hayward fault is a key factor in our lithodiversity. Earlier faulting has added similar complexity to the top portion, representing the high hills. 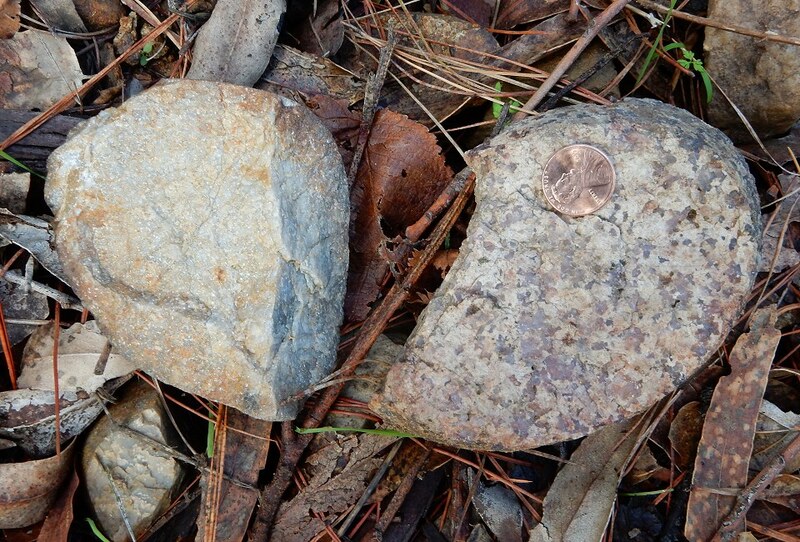 Here are the new rock types I was able to document, in the order I found them during a 3-hour reconnaissance. First was schist per se. 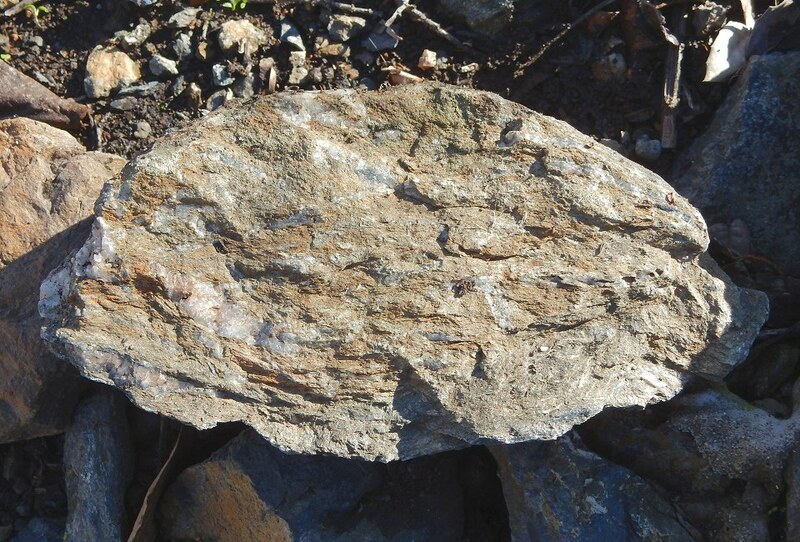 Schist is actually a textural term referring to the thin layers of metamorphic minerals. 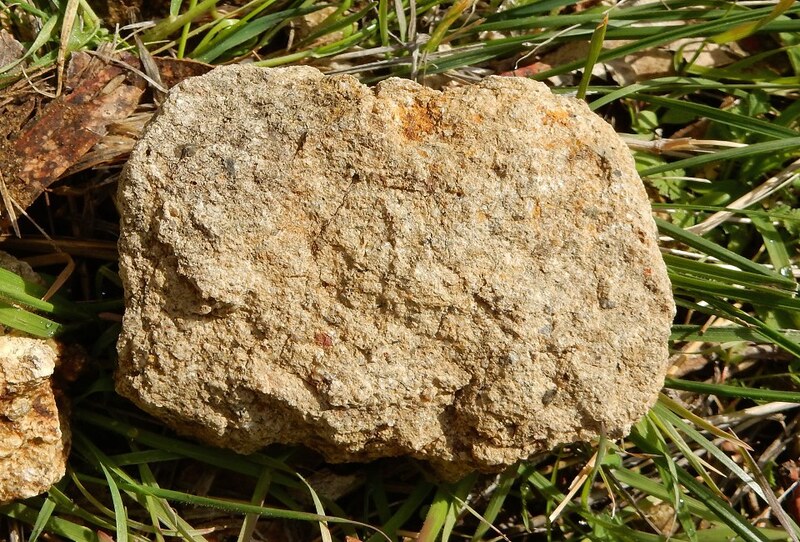 It gets more specific names depending on the exact mineral involved — mica schist is dominated by mica, for example. I was able to claim marble, from a fist-sized stringer in the blueschist knocker of Contra Costa Road, along with the acid test I used to confirm it. 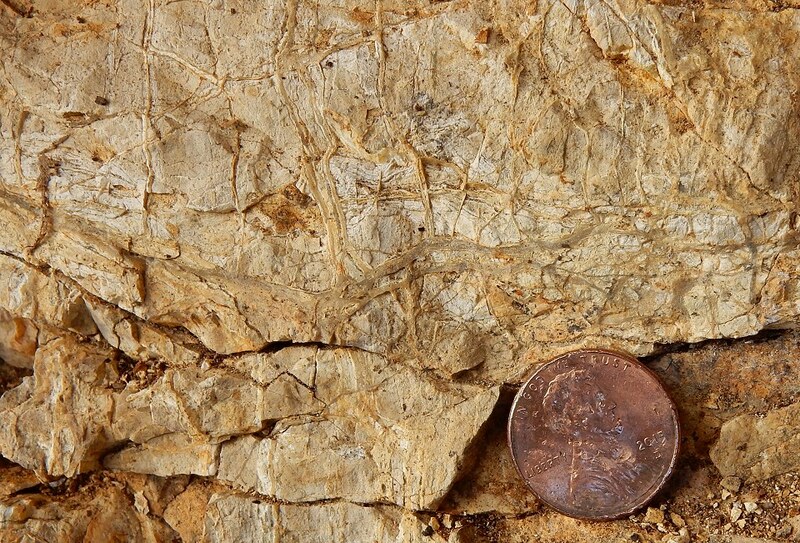 Next was limestone (or dolomite, which is similar), which occurs in pods in the Claremont chert. I bagged tuff along Grizzly Peak Boulevard, where a prominent bed of this lithified volcanic ash crops out. 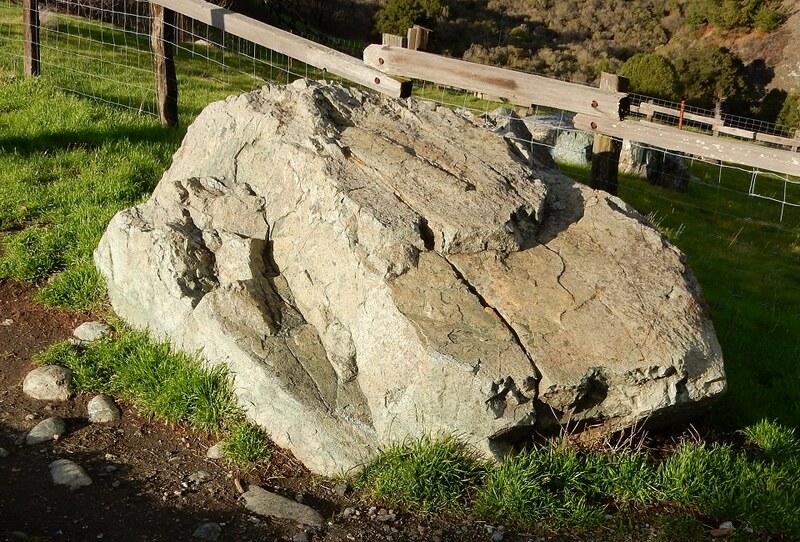 Both quartzite and granite appeared in a roadcut along Skyline Boulevard, where they were cobbles in the Oakland Conglomerate. That’s quartzite on the left, and I thought I’d never see either rock in this town. And finally, up at Serpentine Prairie, I realized that the boulders included some peridotite. This one amazed me the most. It’s the deep stuff from the bottom of seafloor crust, the rock left over after basaltic lava is extracted from it by partial melting. Nearly all of it is recycled into the deep mantle by subduction, and nearly all of the rest turns into serpentine rock. It is rare. I’m here every week folks, visit the giftshop on your way out. This entry was posted on 11 January 2016 at 9:02 am and is filed under Oakland rocks. You can follow any responses to this entry through the RSS 2.0 feed. You can skip to the end and leave a response. Pinging is currently not allowed. Great post, and sorry to have missed your talk! Sounds like you had fun with this talk. As a rockhound and budding geologist living in Oakland’s old Temescal District, I used to collect specimens of all the lithologies mentioned in your blog post. My favorite is a fist-sized agate amygdule (weathered out of the Grizzly Peak volcanics?) I found in 1964 along the tidal flats near the old Berkeley Pier at the mouth of Temescal Creek. I cut it in half and polished it; it’s interior is a beautiful milky-white color with subtle banding.I hope there’s still lotsa good geo-stuff to find in the East Bay. Love it. John C. found a natural asphalt seep in Wildcat Regional Park so there’s hope for asphalt in Oakland. Keep looking. At an exposed serpentine area in Oakland, there are deposits like i expect to see from mineral hot springs. Are you familiar with this phenomenon? I later realized you had been to that site because you have a photo. (Crestmont & Kimberlin Heights). My descriptive abilities aren’t great, but I would say it looks like tufa. Parts have been trodden on and are not distinct but there are untouched areas, too. 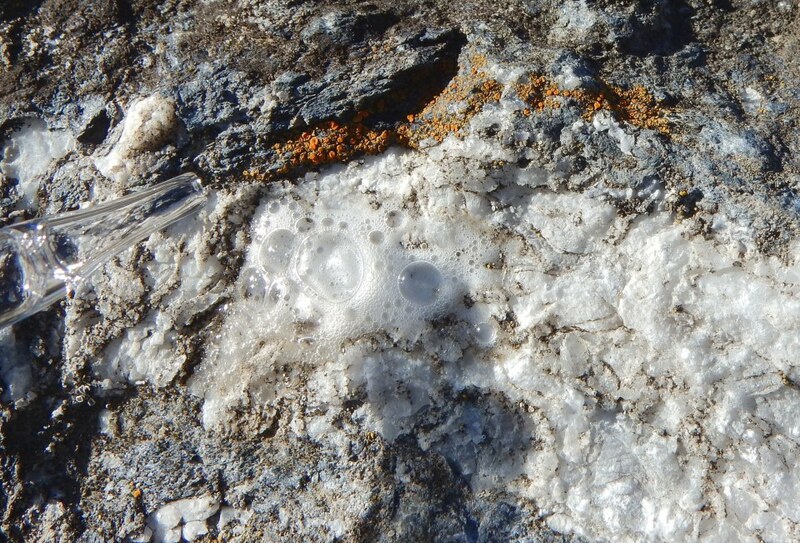 There’s a lot of bluish rock up there that’s honeycombed with soft white material. My working hypothesis is that it’s magnesium minerals (brucite, magnesite maybe) produced during alteration, whether during deep burial or during recent faulting. Hot springs are unlikely, but I can’t rule them out.